"Brina Kei Maxino represented the Asia-Pacific region at the Special Olympics Global Youth Activation Summit when she was 16 years old. 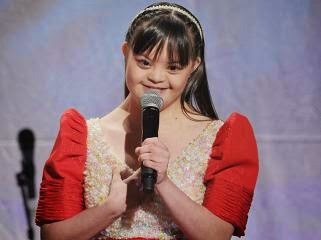 She was the first Filipina and the first teenager with Down Syndrome to do that so let’s give Brina a big round of applause. Yay, Brina!" he added. Maxino was also given a chance to introduce pop star Katy Perry as the performer for the state dinner. The dinner event, dubbed “Special Olympics and A Unified Generation," gathered past and current athletes, volunteers as well as the supporters of the Special Olympics movement, which was founded in 1968 by the late Eunice Kennedy Shriver, sister of the late US President John F. Kennedy. Among the A-list celebrities that graced the event were Stevie Wonder, retired NBA player Kareem Abdul-Jabbar, tennis star Andy Roddick and businessman Steve Case. According to the website of Special Olympics organization, Maxino possessed “above average communication skills” compared to other people her age with Down Syndrome. These skills were witnessed by Special Olympics Philippines executive director Kaye Samson, who first met Maxino emceeing at a local Down Syndrome Association event, the website said. “Brina’s abilities and skills today have surpassed the expectations of doctors and therapists, who had very low expectations for Brina soon after she was born. Years later, a psychologist told Brina's parents that their daughter would find it hard simply to finish elementary school,” it added. In 2013, Maxino graduated from a mainstream high school at the appropriate age of 16. For over a year, she worked part-time as office assistant in her former grade school with competent computer skills. She is now taking AB History in a university. Maximo is also an active member of the Down Syndrome Association of the Philippines (DSAPI) delivering inspirational talks.